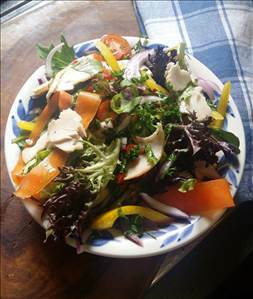 Make the dressing by combining the oil, lemon juice, chilli, parsley and pepper. Mix well then set aside. Combine the remaining ingredients in a large bowl and mix well. Pour over the dressing and toss the salad to coat all the ingredients evenly with dressing. There are 240 calories in 1 serving of Turkey Garden Salad. Calorie Breakdown: 38% fat, 30% carbs, 32% prot.